We report a case of serotonin syndrome that developed after the addition of linezolid to a patient already taking sertraline. The patient improved after both the medications were subsequently discontinued. An 82-year-old female patient presented to the emergency room with an acute presentation of high-grade fever, loose stools, and burning micturition. Her psychiatric history was notable for major depressive disorder (Diagnostic and Statistical Manual of Mental Disorders-IV criteria), for which she has been taking sertraline (100 mg/day) for 3–4 years. On arrival to the emergency room, her body temperature was 38.9°C, pulse rate was 100 beats/min, blood pressure was 162/78 mm Hg, and respiratory rate was 30 breaths/min. Examination of the cardiovascular, respiratory, and alimentary system was unremarkable. Initial laboratory findings were hemoglobin of 10.1 g/dL, the white blood cell count of 6200/cumm with 49% neutrophil, 40% lymphocyte, and 5% eosinophils. Blood urea nitrogen was 32 mg%, creatinine 0.7 mg%, Na 143 mEq/L, K 4.1 mEq/L, and Cl 100 mEq/L. Thyroid-stimulating hormone-0.48 μU/ml, procalcitonin-0.12. LFT-Normal, and urine analysis revealed specific gravity of 1.005 with 8–10 pus cells, proteinuria nor glucosuria. Stool R/E-Normal. She was started on cephalosporin. After 48 h, her urine culture showed Escherichia More Details coli, the same antibiotic continued. On the 3rd day, she started having spike again, suspecting hospital-acquired infection antibiotics were modified and linezolid was added at 12.30 pm. At 1 am at night, she had altered sensorium, had breathlessness with high-grade fever not responding to antipyretic and was shifted to intensive care unit (ICU). On arrival at ICU, body temperature was 104.5°F, pulse rate was 126 beats/min, blood pressure was 158/72 mm Hg, and respiratory rate was 50 breaths/min. Examination of the cardiovascular, respiratory, and alimentary system were unremarkable, in the neurological examination, Her pupils were 3 mm in diameter and reacted to light bilaterally. Other cranial nerve examinations were unremarkable. She moved all four extremities with painful stimuli. Rigidity of the bilateral lower extremities was greater than the upper ones, and hyperreflexia of bilateral lower extremities (4 + patellar tendon). Babinski reflexes were noted. The constellation of the above neurological and mental state features in the presence of serotonergic medication and the abstinence of other central nervous system (CNS) pathology lead to the diagnosis of serotonin syndrome. Sertraline and linezolid were stopped and the patient was aggressively hydrated with intravenous fluids. Within 24 h, the patient's mental status had improved. By the 2nd day, on this treatment regimen, the patient's function returned to baseline, and she was shifted from the ICU with psychiatric follow-up. This patient was diagnosed with serotonin syndrome. Nevertheless, in our case, administration of sertraline did not reveal any symptomatic interaction, as the serotonin syndrome was induced only after the addition of linezolid to the treatment regimen. Serotonin(5-HT) is a neurotransmitter produced in presynaptic neurons from L-tryptophan. The concentration of serotonin available at postsynaptic receptors is regulated by a combination of feedback loops, reuptake mechanisms, and metabolism. Serotonin syndrome should be suspected in a subject who has recently taken a drug that can disrupt serotonin balance and has sudden onset of autonomic, cognitive, and neuromuscular symptoms in the absence of metabolic and infectious causes for the clinical constellation. 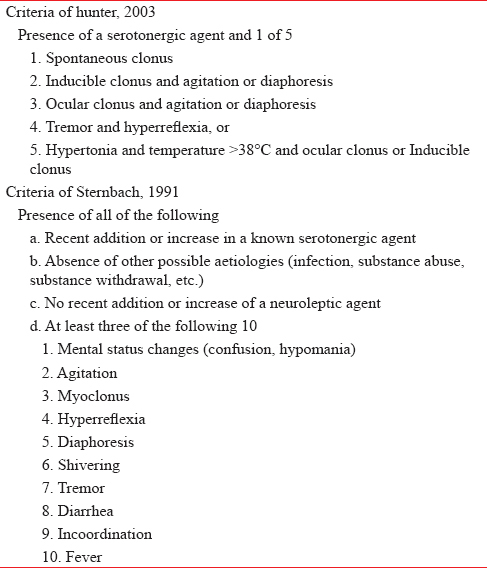 Serotonin syndrome usually consisted of a constellation of neurological and mental state symptoms and commonly diagnosed according to the widely accepted criteria of Sternbach and/or Hunter,,,, as summarized in [Table 1]. Serotonin syndrome is a drug-related complication that arises when two or more serotonergic drugs are administered concurrently resulting in a drug interaction causing excessive release of serotonin or blockade of reuptake receptors. The onset of symptoms manifests within 6–8 h of the administered dose. Symptoms can range from mild to potentially life-threatening. Other causes such as infection, substance abuse, or withdrawal must be excluded before making a diagnosis of serotonin syndrome. Cases of serotonin syndrome are on the rise, probably due to an increase in the availability and use of serotonergic drugs. It has been observed in all age groups, including newborns and the elderly., The reported drug interactions that have caused serotonin syndrome to continue to increase and include many different combinations of serotonergic drugs. The most well-known combination is selective serotonin reuptake inhibitor (SSRI) with an monoamine oxidase inhibitor. However, the combination of any two serotonergic drugs can possibly precipitate this syndrome and therefore should be used sparingly or with great caution. The development of the serotonin syndrome has been reported as an interaction of linezolid plus almost every category of antidepressant medication. Interactions have been found with the selective SSRIs as citalopram, escitalopram, paroxetine, fluoxetine, sertraline, and symptoms usually improve with the withdrawal of the predisposing drug agents plus supportive care, as there is no specific evidence-based treatment of the syndrome. Cyproheptadine is an H1-histamine receptor antagonist as well as a nonspecific serotonin receptor antagonist which may have a role in serotonin syndrome treatment in a usual dose of 8 mg via the nasogastric tube. Furthermore, the serotonin syndrome pathophysiological mechanism doesnot include idiosyncratic, neither idiopathic nor pharmacokinetic drug reactions, but it is considered to be a predictable and preventable pharmacodynamic consequence of the excess of serotonergic agonism in CNS and peripheral serotonergic receptors. We suggest that physicians avoid the use of linezolid in patients receiving sertraline due to possible serotonin syndrome induction. Birmes P, Coppin D, Schmitt L, Lauque D. Serotonin syndrome: A brief review. CMAJ 2003;168:1439-42. Boyer EW, Shannon M. The serotonin syndrome. N Engl J Med 2005;352:1112-20. Erratum in: N Engl J Med 2007;356:2437. N Engl J Med 2009;361:1714. Taylor JJ, Wilson JW, Estes LL. Linezolid and serotonergic drug interactions: A retrospective survey. Clin Infect Dis 2006;43:180-7. Bril V. Treatments for diabetic neuropathy. J Peripher Nerv Syst 2012;17 Suppl 2:22-7.